AC Sports Car History. The AC marque represented the oldest British car manufacturer, with continuous production stretching as far back as 1901. 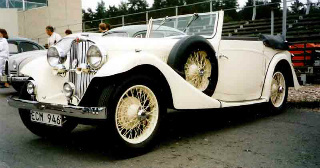 That year, John Weller established a small engineering business near London with the purpose of producing motor cars. In 1903, he had designed and built his first car, powered by either a 2-cylinder or 4-cylinder engine developing 10 hp and 20 hp respectively. They were presented at the 1903 British Motor Show, and were well received. In 1904, the business was called Autocar & Accessories, and produced a tricycle called the Autocarrier, with a 5.6 hp air cooled engine, and customers such as the Goodyear Tyre Company. By 1910, the Autocarrier was used by the London Cycle Regiment to carry equipment, such as ammunition. In 1911, with rising demand, production was moved to a larger premises south of London, where production of the Autocarrier continued until 1915. By this time, Weller had designed the first production four wheeled car, and the company was renamed Autocarriers Limited, with Weller as a Director. In 1918, production began on the new two seater, four cylinder, four wheeler which gained popularity in competitions, especially hill climbs and trials. In 1921, the company expanded into a showroom in London's Regent Street, and once again changed its name, this time to AC Cars Limited. The new AC's were sporty, with excellent performance, and displayed stylish bodies offered in a range of colours. In 1922, a special AC car, with a 16 valve, 4-cylinder engine, broke the One Hour record at the famous Brooklands race track, with the fastest lap at a speed of 105 mph. Over the next six years, the company produced seven new models, by which time the power from AC's 6-cylinder engine had risen from 40 bhp to 56 bhp. By 1928, the AC Car Company was the UK's largest car manufacturer. In 1929, following the Wall Street Crash, AC went out of business. However, a year later, AC was acquired by the Hurlock brothers who realised there was a market for hand made cars. All through the 1930's AC cars, with their 6-cylinder engine, made a name for themselves in the RAC and Monte Carlo rallies. New showrooms were acquired in Park Lane in London by the now financially secure AC Car Company. In 1933, four AC cars were entered in the RAC rally, and all did well, with one of the four seater sports models being the outright winner. By 1937, AC cars were being exported to the US right up to the advent of WW2. Soon after 1945, following a period of development and improvement, production began to increase. By 1950, the AC 2-Litre car was being produced at the rate of five units a week as a two and four door saloon, drophead coupe, and tourer, all powered by AC's 6-cylinder engine. 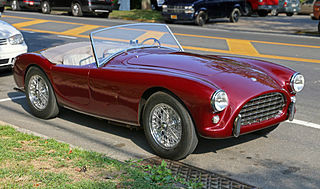 1953 was a landmark year with the launch of the AC Ace, a two seater convertible, which gained wide acclaim with British club competitions, involving race and rally meetings. At the 1954 London Motor Show, the company launched the AC Aceca fixed head coupe, powered by AC's 2 litre, 6-cylinder engine. In the 1957 Le Mans race, an AC Bristol finished in tenth position, still powered by that 2 litre, AC engine. The company received its biggest break when, in 1961, Carroll Shelby wanted to install a huge Ford V8 engine into the AC Ace sports car. The resultant car, the AC Cobra, built by AC Cars, turned out to be one of the fastest and most brutal sports cars that had even been built. By 1963, this hand built icon, with an aluminium body, was being produced at the rate of 15 units a week.